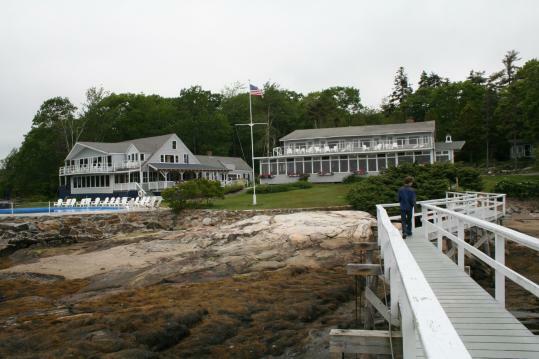 BOOTHBAY HARBOR — I always like to plan a short trip with the family after the school year ends and before summer camp begins. It’s a reward for surviving that often frenzied schedule of finals, dance recitals, jazz performances (my son, Jake, plays piano), packing for overnight camp, and frequent trips to Logan International Airport to drop off and pick up Dad. With cabins and lodges nestled amid the trees above the coastline, Linekin Bay has the look of an upscale sporting camp. Indeed, it originated as a girls camp in 1919, before transforming into a family-oriented resort after World War II. All meals are included in the price of lodging and there are no keys for the rooms. When the resort fell on hard times in the early ’90s, there was talk of modernizing and converting the cabins to condos. Loyal patrons were aghast and put a stop to that silliness. At the entrance to the main dining room, where all meals are served after the bell rings, we met Betty Jones, 96, from Worcester. She said that she had been coming here every summer for 67 years. “I come for the people, the food, the sailing, everything,” she said with a broad smile. The food was surprisingly good. No franks and beans for dinner here. Instead, expect swordfish with an olive tapenade sauce or hangar steak with crispy french fries, all washed down with local microbrews like the Allagash White Ale from Portland. The weekly highlight is the lobster clambake on Tuesdays, featuring live music on the deck. It was chilly that first night, so we decided to go back to our lodge and make a fire in the grand stone fireplace. Wood and kindling were already chopped and ready. Calling on his long dormant Cub Scout skills, Jake created a roaring fire that lasted a good two hours as we played a lengthy session of Apples to Apples. The next morning we awakened to blueberry pancakes with Maine maple syrup, played one of numerous games of Ping-Pong in the rec room, and then headed to the water activities shed to request a sailboat. Sailing is what put the resort on the map. The resort has a fleet of 20 Rhodes 19-foot sailboats. Sail with or without an instructor, depending on your expertise, and sample the southerly breeze that averages 10 knots. We put up the sails and lowered the centerboard and immediately caught a strong wind toward pine-studded Cabbage Island. The only obstacle was the occasional lobster boat picking up traps. We tacked back and forth, making our way to the mouth of the bay as seals lounged on large boulders and osprey flew overhead. In the distance we spotted the lighthouse on Burnt Island and a schooner on the horizon. On the return trip, we sailed wing on wing, jib on one side, mainsail on the other, as we zipped back to our mooring. “This is what we do here,” I said to my wife, now smiling ear-to-ear, naturally high from the odoriferous delight of saltwater mixed with pine. That afternoon, we followed Rupert Neily on one of his rambles through the peninsula. Neily spent his childhood in East Boothbay, before making a name for himself in land conservation, serving as director of the Maine Land Trust Network. Then, in 1998, he found out he had leukemia and realized he didn’t just want to protect Maine’s coastline, but give people a first-hand encounter with the trails and byways he cherishes. So he became the resident naturalist at Linekin Bay. We followed Neily on a route along the shoreline, watching water tumble down rocks to the ocean. We took a set of stairs into a residential neighborhood far removed from the commercialism of Boothbay Harbor. Neily pointed out a pair of cottages that in the early part of the 20th century had sat atop ships. Other walks would beckon, such as the exquisite grounds of the Coastal Maine Botanical Gardens or the quiet shores of the Porter Preserve on Barters Island (stopping for the requisite lobster roll at Trevett Country Store), always retreating to the chairs on Linekin Bay’s deck afterward. One night, we did manage to find a flat-screen television behind the game room where the property hosts movie night. We threw in a DVD of that epic revenge story “The Count of Monte Christo,” as I savored more of those rare moments together, moments more fleeting now that both children are teenagers. On our last morning, we took a second loop around Cabbage Island, this time in sea kayaks. Then we had to check out. “Going so soon?” said Jones. “Yes, unfortunately it’s time to get back to the rat race,” I said. “Well, next time spend at least a week,” she said. “I think I’ll do that,” I said, and I hope we do.